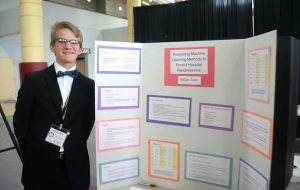 William Tobin, a junior at Fairmont Senior High School, did a project on hospital readmission data, which he presented at the State Science Fair Saturday. FAIRMONT, W.Va. – William Tobin wanted to figure out the likeliness that an individual being treated with cardiac problems would be readmitted to treatment. The issue is one close to his own heart, as his mother is a nurse at Ruby Memorial Hospital and he felt it was a concern for the region.